Enter your name & email to get the entry form to visualize what you really want to do in your life after you're 50! You will also receive regular updates about other easy ways to regret-proof your life! 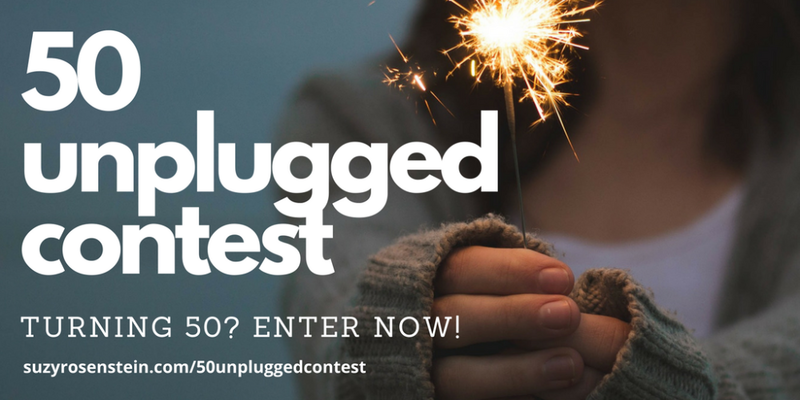 It's the perfect time for you to start thinking about what you want to create in your life ON PURPOSE by entering the 50 UNPLUGGED CONTEST! As a woman in the middle, I'm thrilled to welcome you to the most exciting phase of your life so far! Once you opt in to the contest, you will get your entry form via email. Please take a moment to answer a few questions about your thoughts around turning 50. That's all you need to do - just send it in and you're entered into the 50 UNPLUGGED CONTEST. Only takes a couple of minutes. THANKS SO MUCH FOR YOUR PARTICIPATION AND I'M SO EXCITED FOR YOU TO UNPLUG YOUR 50TH BIRTHDAY AND DREAM BIG! GOOD LUCK! *All Winners will be announced by December 31, 2019. **Podcast guest winners will be chosen based on the sole discretion of Suzy Rosenstein and her assessment of "fit" for the Women in the Middle Podcast. Coaching session winners will be drawn randomly. ***By entering this contest, you give consent to having your answers used anonymously in promotion and/or in upcoming publications.